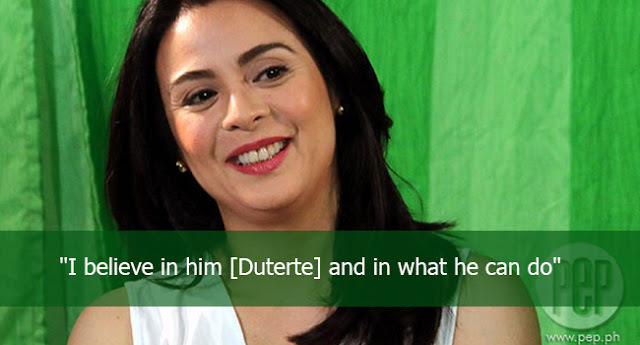 Home Local News Dawn Zulueta: "I Believe In Him [Duterte] And In What He Can Do"
Dawn Zulueta: "I Believe In Him [Duterte] And In What He Can Do"
Prominent actress Dawn Zulueta believes in the leadership of President Rodrigo Duterte for he’s the one who could deliver change to the Filipino people. The 47-year-old actress said she is convinced since she witnessed how Duterte led Davao City as the mayor for 20 years when she moved there to reside. In 1997, Dawn moved to Davao when she married Anton Lagdameo Jr. who was a businessman before and suddenly entered politics as Davao Del Norte’s 2nd district representative. “Well, ako, naging maganda ang experience ko living in Davao. I loved it there, it was so so peaceful. The peace and order is really fantastic,” the actress said. Zulueta narrated that Davao City is clean, people are disciplined, and the citizens are following the rules set by Mayor Duterte. “Yung pag-manage talaga ni Mayor [Dutertre] doon sa city. Lahat ng mga tao, meron talaga silang respeto sa kanya, so they follow the rules,” she added.